Cockroaches and rancid butter | Hill End, Food and Drink, Wartime Hill End | Out of Sight, Out of Mind? Hilary Anderson (née Gathercole) and Jean James (née Mossman) describe the food available at Hill End during the war, when they worked there as St Barts’ trainee nurses. ‘The food at Hill End was something else. 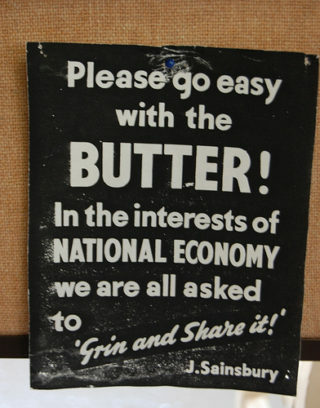 Because of rationing each nurse was issued with her allocation of butter and sugar which she carried to meals along with her gas mask. The butter was nearly always rancid but somehow we managed to eat it. After all, when you are breakfasting at 6.30 in the morning and facing a slice of dry bread, strange luncheon meat, and tea or coffee made with powder and powdered milk all mixed up in an urn, what is a bit of rancid butter to top it off? ‘The meals for the patients came to the wards in large heated trolleys and it was usually nourishing, well-balanced food. However it was the joints of meat that will always be remembered. They came in huge chunks for the sister to carve, and by the shape and texture it must have been horsemeat. No cow or steer ever produced the like of that. Yet we ate it and quite liked it; we knew we were lucky to get that much meat at all.